When I write, my objective is to reach 3 things in every reader: your mind, your heart and your funny-bone. You will find some articles that are merely fun, whereas others are serious and technical. Feel free to email me at darryl@familyfishingtrips.com with any comments or questions. Enjoy! Though regarded as an angler’s secret to success, bait choice is really just a preference. Confidence in your choice directly impacts your opinion in each bait type and style. While some prefer live bait, others choose artificial. Once your choice is made, what type or style do you pick? Do you combine the two to get the best of both worlds? Such questions are just the beginning of the battle over bait. A person can neither begin to test all the jigs on the market today, nor can he afford to purchase them all for his tackle box arsenal. What’s hot and what’s not is only determined by the fish and person’s ability to use it. Jig styles and colors manufacturers make most are what anglers use the most. If the angler isn’t productive with a certain style or color it won’t be purchased often. Talk to other anglers and find out what jigs and which colors they use most. This may vary from lake to lake, but I am confident what you will find is the most basic of colors have proven themselves repeatedly. Though I have at least two-dozen different jig color combinations in my tackle box, my base seven are white, blue/white, black/chartreuse, red/chartreuse, orange/chartreuse, purple/chartreuse, and pink. These are colors manufacturers produce the most, which means they are the colors more anglers purchase. With this color range, every water condition can be approached effectively. I was taught to use dark colors in dark water and light colors in clear water. The darker the water condition the darker the color jig is the pattern that usually emerges. Please notice I said “usually.” Regardless of what the science of light penetration and water clarity tells us, when using jigs, I will always start with my base seven jigs and a minnow on the eighth pole in order to determine a pattern for the day. Yes, you understood correctly. I attach the water with up to eight poles. Nobody can accuse me of not trying hard enough. Now that we’ve determined the most productive colors, what jig style should be used? Though I have just about every style jig known to man, it is the tube that produces the most for me. But for discussion, let’s review the three most basic jig styles – tubes, solid bodies, and hair – then conclude with live bait. The tube is artificial bait that is easily slid onto a jig hook of your choice. The most common tubes come in a variety of lengths with a hollow body and multi-strand skirt. A wide range of scents and attractants can be used with tube baits as well as working them in combination with a minnow. Try dipping your tube jig in cod liver oil. In my opinion, the tube jig is much like the spinner-bait bass anglers use. The tube and the spinner both resemble nothing natural in the water. However, they are both proven baits. Let’s not argue with what works. Some refer to solid bodied jigs as grubs. They are, as the name implies, artificial bait that is solid throughout. The differences are mostly found in the style of tail – paddle tail, pin tail, curly tail, and triple tail are a few. Solid body grubs are excellent baits and create more vibration in the water than your average tube. Today, more lifelike solid body jigs are being produced – shad and crawfish are probably the most popular. Hair or marabou jigs are produced in a variety of ways and are probably the one jig most produced by the anglers themselves as a hobby. Synthetic or natural hair is tied onto the jig hook. I know that sounds simple, but that’s it in a nutshell. They are perfect for producing a natural movement in the water. Often feathers of different colors are used. Some even use hair or feathers in combination with a plastic body. In any case, if you ever meet an angler who exclusively uses hair jigs know this – they are very committed and serious about jig fishing. The most commonly used live bait for crappie is the minnow. You can always identify a crappie fisherman because they buy minnows by the pound and not by the dozen. Depending on the minnow’s size, a pound will yield about 12 dozen on average. For me, a pound is the correct quantity for a short half-day trip. The most I and another guide have used in a single weekend was three pounds. Varieties of minnows range from small to medium shiners to bull-nose tuffies. My favorite is the Rosey Red. This little orange tuffy is hardy, usually lives longer in well oxygenated, cold water, and is an irresistible morsel for all crappie species. Whether you choose live or artificial bait or you prefer one color or style jig over another, fish what gives you confidence. Landing the big one requires no water. Though one may land it while participating in other outdoor sports like hunting, fishing is my preferred choice. To land the big one, an expensive boat and top quality tackle aren’t needed. Landing the big one does, however, require good timing and a desire to experience it. By now, you’ve probably guessed that I’m not talking about catching a big fish. No, I’m not, but let me tell you the story. Last year, my elder son, Josh, and I began preparing to fish a classic crappie tournament on Lake Norfork in Mountain Home. You see, to us, fishing is more than just fishing. Do research; talk to the local fishermen; find a guide who will share information; keep records on water temperature, lake levels and barometric pressure, and pre-fish the lake as often as possible; test out new techniques; get as much experience on the lake as possible before the big day. We were told that crappie were once very prolific in Norfork. But with the clear water and the introduction of white bass, striper and hybrids, the crappie population dwindled. Discouraged, but not defeated, we conducted our own research. After digging deep into the abyss of the Internet, we found one article that inspired our next step - find the sunken trees. Over the past several years, the Arkansas Game and Fish Commission had sunken more than 90,000 trees in both Norfork and Bull Shoals lakes and marked these brushpiles with fish attractor signs. Ah, that’s a good start. In addition, the AGFC had stocked the lakes with as many as 200,000 crappie fingerlings per year. To top it off, the lakes were blessed with an outstanding spawn about three to four years ago. Armed with this new information, we set out to apply all we learned. We fished almost every weekend for nearly three months. We fished every major creek arm. We fished deep and shallow brush. We fished early in the day, all day. We were going to own this lake and run away with the prize with all other participants singing our praises. Well, as you can guess, that didn’t happen. The first day of the tournament was plagued with foul weather and strong winds. We only weighed in two legal crappies putting us at about 100th place out of 120. The final day of the two-day tournament was better. We topped our seven fish creel with average fish. We moved up considerably in the field, but not enough to take home the big prize. We launched the boat and, in complete darkness, we sped across the perfectly calm water to a spot just north of Bidwell Point. Quietly, we glided into position and began fishing for the crappie hidden in the depths of a massive, sunken tree. To me, there is an all-consuming, inspiring period of time each day just before the sun rises when the world plays its own reveille softly and slowly. It’s called “First-Light.” You can hear the nocturnal creatures retreating to their lairs and those of the day coming out to play and sing. The silhouettes of the creation begin to focus. Often, even the breeze stops as if the whole earth is yawning for its first deep breath of the day. This is a time of perfect peace. It’s as if time stands still for just a few moments. Words just can’t describe it justly. All the worries and cares of this world vanish. All the stresses of life are gone. All is quiet and still. Then, screaming from the back of the boat, I heard, “Daddy, I got it!” After such a start, adrenaline rushing through my veins, I spun around and grabbed the dip net, ready to land the big one. You should have seen the look on Josh’s face. To my surprise, Josh had just landed the big one so many miss. “Dad, I just got it – ‘the glory of first-light,’” he proudly declared. And then, for the next 15 or so minutes, I was blessed to hear my not-so-talkative son describe to me all he had just experienced. Admittedly, not every morning offers an experience this perfect. All too often, they’re more like a drill instructor throwing a G.I. can down the middle of a squad bay. But my recommendation to all is simply do what you can to experience the glory of first-light as often as you can. Help those whom you love land the big one. It is a privilege and an honor to take people fishing with me. When I first started guiding for crappie, I worried about not being able to put my clients onto a good mess of crappie. I thought, “Nobody in his right mind would seek such humiliation.” But, when I changed my perspective, all the worries went away. “I’m just taking some new friends fishing,” I told myself. If we do well, great! If not, it happens. The new perspective, however, didn’t eliminate the need for patience. My grandfather was probably the most patient man ever when it came to the fish and fishing. More than once, I watched him bait his hook with a minnow and sit for hours waiting for that one big catfish. Not me, I don’t wait for the fish to come to me. I, with a sense of urgency, go find the fish. Being impatient with the fish is a good thing. It’s more productive and fills your livewell faster. No, the patience I speak of is with the clients – the new friends I take fishing. Every client, young or old, male or female, has a differing degree of expertise. Some need and welcome more help than others. Some listen better than others. And some are funny, while others are serious. But, I must be patient with each of them so their trip is memorable. I am proud of myself for being patient with all those who fish with me. Even when fishing with family, if I treat them like clients, it helps me remain patient. Hundreds of fishing trips have come and gone in the past several years and not once have I lost my patience – except once! Well, to be honest, it was a little more than just loosing my patience. I also offended the client for laughing so hard I almost fell out of the boat. The boat I have now is a long, wide, V-hulled boat that serves as a very stable platform. No one person could turn it over if they tried. Standing and walking around does not bring about the immediate danger of capsizing. But several years ago, I fished from a small, flat-bottom, modified johnboat. I would tell my clients, “Stay seated for safety and we’ll work together to help each other.” All did, but one. It was a warm summer morning on Lake Charles and the catch of the day was bream. I had fished the day before, boating more than my share of keeper bluegill, shell crackers and sunfish, so I knew these clients were going to have great success. If you’ve never fished with ultra-light tackle for creation’s most prolific freshwater fish, then you’re missing the time of your life. It’s not fish’in – it’s called catch’in. Anyway, ultra-light rods in hand, crickets already all over the boat, we quietly slipped up to the first bank and I reminded my clients to stay seated at all times. All they had to do was swing their hooks at me and I’d bait them up. When they caught a fish, they were to do the same. I’d do all the work and they’d do all the catching. Things went well, for the first minute or two. Two of the three clients, young boys, did just as I had instructed them to do and they immediately began landing fish. The third client, an adult female whom I will not mention by name for fear of life and limb, was not capable of following my safety instructions due to her overwhelming excitement. She cast into the perfect spot. Two large boulders, just under the surface of the water, lay close to each other. Her bait landed between them and within seconds the float disappeared. Now, most amateur anglers don’t know to keep their rod tip high when reeling in the fish. Not her, just like a pro, the rod tip remained high. In fact, the entire rod was held over her head, reaching higher and higher. She squealed with excitement as she fought this mammoth bluegill. She stood up. Obviously, to get the rod even higher, hoping the fish would come closer to her. I directed her to please stay seated and just reel it in. And, before I knew it, here she came. Instead of reeling in the fish, she walked, stumbled, and tripped her way from the back to the front of the boat. The boys complained and the dog yelped when she stepped on them. The boat rocked and rolled. We all hung on, knowing the boat would capsize any minute. Wow, it’s over and we didn’t get wet. We landed the fish and carefully she returned to her assigned spot in the back of the boat. While I baited her hook for the next fish, again, I reminded her to remain seated and just reel. Well, you can guess what happened when the next fish took her bait and became fouled with her hook. We screamed, we cried, we laughed. The boys even learned to make a path for her saying, “Here she comes again, hang on!” Not once, not twice, not three times, but four times did she do this before mastering the rule – stay seated in the boat. I learned a valuable lesson from this unnamed, excited woman. Catching fish should be exciting. It should be an experience that takes your breath away and makes you do silly things. Since then, I’ve noticed professionals on the Bassmaster’s tour crying out words like “Oh yeah!” and “Booyah!” while throwing their hands into the air in triumph. That’s what fishing is all about. And, it doesn’t matter if it’s a hand-sized bream, two-pound crappie or tournament-winning bass. So, the next time you hook one, make sure everyone around you knows. It’s okay to show your excitement. And, if you do something silly, well, that’s okay too. I have been accused of many things, and being a fair-weather fisherman is not one of them. I often tell people there are only four things that will stop me from going fishing: my wife, hurricane-force winds, monsoon rains, and lightning. My wife does come first even though I’m on the water 32 or more weekends out of the year. If she really, really needs me to stay home, I will. I may beg, plead and pout when trying to make her change her mind. But, when no compromise can be reached, I’m land-locked for the weekend. Maybe I can sneak in a fishing show or two. Even a casual fisherman knows the wind is the greatest enemy of boat control. We turn our trolling motors up on high, use windsocks or buckets and even drag our anchors attempting to overcome the wind’s effects. However, when the wind is so fierce that you can’t launch your boat without sinking it, it’s time to go home. Enduring rainy days is also commonplace when fishing. Otherwise, why do so many retailers sell waterproof clothing? And, isn’t that what the automatic bilge pump is for anyway? Bright, clear, bluebird days aren’t really good fishing days anyway. Nonetheless, when it’s raining so hard you can’t see your fishing partner in the back of the boat, it’s time to stay off the water. Lightning is something every angler should take very seriously. Each year, if I remember my statistics correctly, more people are struck by lightning when on the water than when on land. If you can see the lightning or even faintly hear a roll of thunder, you are at risk of being struck. Just think about it. You’re the tallest object in the middle of a large, flat expanse holding a long, graphite rod in your hand. Get off the water and take cover. Braving the elements is just part of the sport. In fact, some of my most productive trips were either just before or during foul weather. Take last November as an example. My father, two sons and I were fishing Lake Norfork . The weather was only cool, but the wind made it very difficult to control the boat. Plus, a new cold front was due to arrive mid-morning the next day. The end of the first day’s fishing loaded our stringer with two limits of twelve-inch crappie. The next morning, before the severe weather forced us off the lake, we landed another two limits within an hour. Reelfoot Lake in Tiptonville, TN is known for it’s abundant crappie and strong winds. On a trip there last year, my younger son, Levi, landed nine slabs in the midst of white-capping water and 30-mile-an-hour gusts of wind. We worked together as a team. He fished and I ran the boat keeping us into the wind and upright. It was a pleasure to watch my little man hang in there under such adverse circumstances and fight each crappie into the boat all by himself. The opposite is also true. There have been a few trips where I decided not to brave the elements. As it turned out, the weather cleared and I regretted not fishing on that day. My frustrations were only magnified when my fellow anglers who did venture out on that dreary day emails me pictures of the monster catches. Since I’ve started guiding, weather is always a top concern – safety issues from my perspective and comfort from the client’s. If the weatherman or weather.com is predicting a 30% chance for rain, I say there’s a 70% chance it will not rain. Unfortunately, most clients don’t see it that way. Recently, with a bit of persuading, a young couple agreed to keep their booking on Lake Hamilton. It was drizzling rain and all weather reports called for an 80% chance throughout the daylight hours. A mere hour and a half after we launched the boat, the rain cleared and they took home 26 slab crappie and one three-pound bass. We virtually had the lake to ourselves and didn’t really get too wet anyway. No doubt, many other anglers got up that morning and went right back to bed opting not to fish on this rainy morning. They missed a great opportunity. Understandably, foul weather fishing can be difficult. However, don’t let a little wind or rain keep you off the water. Always be safe when fishing in foul weather. Colder weather is coming. So, dress appropriately and I hope to see you on the water. You just might experience the best trip of your life. My favorite fishing partner passed on a few years ago. Louie, a chocolate-brown mutt, became part of our family through the tender-heartedness and trickery of my older son and wife. Near death, by starvation, and thoroughly tick and flee-infested, this dog panhandled his way into our backyard, eventually into our living room and then in my boat. The family wanted a dog, but I insisted that such responsibility would stifle our plans. The answer was, “No!” So, without my knowledge at the time, they nursed this dog back to health. Before I knew it, we had a dog. It was mutiny. He was the perfect fishing partner. He was johnny-on-the-spot for every trip, never rocked the boat and praised you for every fish caught. His only shortcoming was squirrels. Squirrels made him loose control. Apart from that, he loved to go fishing. Other men have bird dogs or hunting dogs. Not me, I had a crappie dog. When Louie died, it was a very sad day in our house. We had lost a family member and I had lost the best fishing buddy a man could have. However, the void was quickly filled with a dog as opposite as opposite can be. Jazzy, a coal-black mutt, hates water and, though unofficially diagnosed, has doggie ADHD. She cannot, will not, sit still in the boat. She once even fell out of the boat. I know this to be so, because the first thing that hit the water was her head and not her feet. Other boaters near us at the time were none to happy and neither was I when I had to retrieve her from the water before she drowned. Oh, did I mention, she gets seasick too. It was insanity. Recently, my younger son and I took a scouting trip to Lake Charles. The lake is now at winter pool and it’s a perfect time to use my trusty GPS unit and mark all the stump fields. The spring spawn will be here before we know it and I want to be ready, new customized map at the ready. We have tirelessly tried to socialize Jazzy and decided to take her along. I can tell you, it’s not working. When it came time for her to get into the boat, she did. She was brave and overcame her fear of water and traumatizing misfortune of falling out of the boat. She must have wanted to be with us more than being left behind, locked up in the truck. The easy part was over and the fun began. Jazzy ran circles from the front to the back of the boat as we sped across the lake. Levi was certain the rate of speed would somehow launch her out of the boat. I acted as if I didn’t notice. Honestly, it would have been a perfect cool-down for such a hot dog. We arrived at our destination. I swung the trolling motor over the side and stepped on the momentary switch on the foot pedal. Nothing! Well, it worked just fine yesterday when I checked it. It might not be plugged in well. I checked the plug. Nothing! Oh well, back to the boat ramp. Tools and voltmeter at the ready, I find that we’ve got power to the plug. Guess what? I traced power right down to the on/off switch. It was delirium. Okay, the trolling is on now and working. We zoom back across the lake to the first stump field. Rods in the water and GPS acquiring three appropriate satellites, we quietly begin our day’s mission. All was well, for about 30 seconds. Jazzy, in the back of the boat, begins to growl and bark as if her and our lives were in grave danger. She discovered she’s in a world of dog-eating monsters. We humans call these dog-eating monsters, stumps. But, to her, they had arms that were reaching for her. She growled and barked at each one. And, when one got close enough to the boat, she’d bite it and fight it off with a violent vigor. She’d seek our approval (or maybe protection) each time after spitting out dried moss and mud that filled her mouth. She did this for nearly 2 hours. It was hilarious. We accomplished our mission and all the monsters were slain. During the trip back home, I pondered the day’s events, while Levi reclined in the passenger seat and Jazzy curled up on the back seat, both sound asleep. I realized we make memories, both good and bad, every day and often do so without realizing it. In the end, I only hope and pray, whether at work or play, the good memories out number the bad ones. Perhaps, if we choose to make good ones, we’ll accomplish that mission too. Recently, I had the privilege to participate in a memorial crappie tournament in the name of the late David Summers, Tennessee ’s own TeeZur Jigs. David made his own jigs and often shared them with fellow anglers. It was his passion and purpose for the sport. The tournament was held on Kentucky Lake ’s Big Sandy. And, as with every tournament, there was adversity to overcome. First, came the rain. Well, it would be better said, an outright downpour. Second, came the wind. Since Big Sandy is relatively shallow, the wind created massive swells. Finding a place to fish out of the wind was imperative. By the end of the competition, my partners and I had landed an ample number of crappie. Our creel weight was shy of the top ten, but winning was not our purpose for being there. Nor was it the purpose for the nearly 100 boats participating in this memorial tournament. We were there to have fun, fellowship and remember a man who loved the sport of crappie fishing. The singular purpose of so many anglers was quite inspiring. Testing your skills on unfamiliar waters; challenging yourself to fish when you normally wouldn’t fish; and making new friends is what tournament fishing should be. However, that being said doesn’t eliminate the frustrating demands and satisfying rewards of tournament fishing. Preparation, pre-fishing, and performance are common issues an angler must consider whether you are on a bass, crappie, walleye or striper tournament trail. Here are a few tips that will make you a winner at every tournament. Preparation is, in my estimation, the most difficult and time consuming. First, you must decide whether or not you wish to fish that particular tournament or not. Then, if you have decided in the affirmative, you must collect as much information as possible and make travel plans. Start your search with the Internet. There, you will find everything from lake statistics to fishing reports to lodging recommendations. Local anglers usually have the best information. However, finding one willing to share information when you’re on the lake is near impossible. Try this. Find a message board on the Internet for that particular lake or species of fish. Post a message asking for a report on the lake of your choice. Inevitably, you will receive several contacts and gain all the information you need. For crappie, try www.crappie.com. This board has a main forum as well as one for each state. Once your research is complete, then comes the hard work of preparing your boat and tackle. So many anglers wait until the last minute or skip this step. Big mistake. Clean out that ole boat. Make sure all your equipment is in good working order and safe. Replace your line if needed and re-tie all knots using new, sharp hooks. You’ll be glad you did when that state record takes your bait. When you get to the lake and start your pre-fishing, relax. Remember, you’re not there to catch every fish in the lake. Pre-fishing is nothing more than testing out different areas and techniques, looking for a pattern. Get a good feel for the lake. Try to see in your mind’s eye what the lake is like under the water. Use a map and a GPS unit. When you find a good spot, mark the map and set a waypoint in your GPS. Now, it’s tournament day and you’re ready. Good planning does make for good performance. However, when it comes to fishing, it doesn’t always work out that way. If you win or place, great! But, if you don’t, you’re still a winner. Walking away from a tournament, having learned at least one thing that makes you a better angler, is a prize in itself. Measure your performance in personal satisfaction and you’ll never loose. Checking the plug is probably the first and most basic of tasks to do when launching a boat. For some unknown reason, this step seems to elude me more times than not. It’s a really good thing, I have a functioning bilge pump. Without it, I would have certainly sunk my boat many times over. Making rookie mistakes is just part of boating. Recently, some of my cyber-fishing buddies had a lengthy chat and a good laugh about all our near misses. Here’s just a few to read and know you’re in good company. Not everyone grows up on a farm. And, even if they did, you still have to learn to back a trailer sometime. Backing into the garage wall, door or over the mailbox is not uncommon. Snaking your way down the ramp after two or three tries is expected. Just try to stay to one side on wide ramps. Trying to launch your boat with the tie-down straps still attached happens more than you think. If you fill her with water, just drag her out, pull the plug (if it’s in) and start again, without the straps this time. You may find yourself in a situation where you must launch your boat solo. Using a long length of rope tied to boat and trailer is one method. It works well too, when the knots are secure and your boat doesn’t drift to the middle of the lake. Be prepared to swim for it. Keep a close guard on your boat keys. I left mine laying on the bumper once and drove 40 minutes away to fish. Luckily, they were still there. But, that still doesn’t mean the ole boat will start. Fast cranking but no fire means the boat is in gear or the cable is pulled from the kill switch. Been there, done that, and it only cost me several hours and a new set of plugs. Most boaters don’t have this problem, but if it happens to you, you’re not the first. Take the transom saver off before you launch the boat. You’ll either break it or loose it to the bottom of the lake. All that and we’re not even in the water yet. Once you have successfully launched the boat, the trolling motor is probably the next victim. It won’t run if the switch is in the “off” position. Leaving your trolling motor down when flying across the lake is not wise. Unbreakable shafts break, if you trailer your boat with the motor down. Running out of gas and having to be towed is no fun. Shorting out wires connected to the batteries melts carpet and starts fires. Running across the lake with the anchor still deployed is a major drag. Approaching your trailer at a high rate of speed tends to bend and dent the bow. And last of all, the amount of insurance you have on your boat is never enough. These and many other unfortunate mishaps have happened to me. I think it’s just the nature of the beast and hope it’s not the beast operating the boat. Make for yourself a checklist. It will build good habits and make your boating adventures safe. I’ll leave you with these words. Life is not measured by the number of breaths we take, but by the moments that take our breath away. One should never think fishing is just a man’s sport. Some of the world’s top anglers are women. In fact, a Google search for women anglers yielded 224,000 hits. Another search for professional female anglers produced 36,000 matches. And, an even narrower search for Arkansas professional female anglers found 5,610 related sites. From ancient times with nets and spears, to today’s high-tech tournament tours, women have played a dominant role in all aspects of fishing. Each year, more women top the winner’s charts and take center stage. Their involvement and accomplishments are only limited by their own desire. I applaud these women for their accomplishments. But, there’s an even larger group of women who have never received a top national award or got their picture taken with the big check. Women like my wife, grandmother and a spitfire redhead I know in south Texas who ranks in the top five best anglers I’ve ever known. It’s these women who deserve a standing ovation. Around my house, she’s called the “crappie widow.” We men, spend so much time and money on the sport we love and often forget about the one who really makes it all possible. She’s there, lending a helping hand, when you’re working on the boat. She’s up early and makes you breakfast. She fills your thermos with coffee, and then ensures you don’t forget and leave it at home. She wishes you luck, with a kiss, and prays for your safe return. When your trip was successful, she’s genuinely impressed. When you come home empty-handed, she provides encouragement. She rarely denies you an opportunity to purchase more tackle and equipment that you really don’t need. In a sense, she’s your business manager, bookkeeper, receptionists, cook, maid, deckhand, friend, fishing partner, and fan club all rolled in one. Her sacrifice and support are essential to your angling success. She deserves to be rewarded for her efforts. And, I’m not talking about a new rod and reel combo, unless that’s what she wants. Men need to realize that we have an outstanding fishing partner in our wife. She may not want to fish every weekend, but when she does, you just might learn something from her. Women anglers are generally more patient and possess a certain intuition that produces more fish and often quality fish. You should make her trip comfortable and respect her likes and dislikes. Now’s your chance to slay her dragons and she just might see you as Prince Charming when you get home, providing you don’t say something to ruin the special moments. Plan for retirement. Everywhere I go to fish, I see senior couples fishing together. Obviously, a couple that fishes together, stays together. Angling mother’s pass on the legacy, heritage and tradition of fishing to the next generation just as much as, if not more than, fathers. Thank you for being there! Now that Christmas is over, did you get all the new tackle you wanted? Probably not, and I’m not going to make it any easier. Don’t fret, there’s plenty of time before the spawn. Consider stocking up with hair and feather jigs. Some may consider the hairy side of jig fishing as old school, but it may be time to get back to basics. Hair and feather jigs were used long before rubber and silicone tubes were invented. It’s classic and always productive. Most who target panfish, use minnow or tubes. Try something new and innovative in 2005. Instead of the traditional tube, go for one that simulates a baby crawfish or a two-inch shad. Target trophy crappie in the shallows by up-sizing your presentation with small crankbaits or even mini spinner baits. If you’ve got your sights set on a state record, don’t be afraid to use a standard-sized three-inch crankbait or swimbait. What about your line? Have you changed it lately? Choose the right line for the job. The traditional monofilaments will never fail you. Just remember to spool it correctly to prevent line twist. You can find hi-vis and low-vis in both monofilament and fluorocarbon lines. If you want greater sensitivity, try a braided line or even a super-braid. Their smaller diameter and anti-stretch features lets you feel a crappie smell your bait. Smooth casting, low memory line may be the ticket to greater success this coming year. What about your terminal tackle? Old, rusted hooks are dull. Try new laser sharp, long shank cricket hooks for the crappie that elude your hookset. Maybe the new blood-red aberdeens will be your limit ticket this year. If you’ve never fished with anything less than 1/16th ounce leadhead jig, test out some of the new painted-head jigs and go for lighter weights like 1/48th ounce or even 1/80th ounce. Been thinking about a new reel? There are plenty on the market today. Buy what fits the job and your wallet. If you cast for crappie, the right gear ratio that matches your presentation preference will turn tiresome fishing trips into relaxing adventures. The drag mechanism of a reel is also very important. It should be easily adjustable, yet sensitive enough to handle light-biting crappie or a roaming, rolling catfish. Rods, you say! Now you’re talk’in. You get what you pay for. Certainly, some rods are ridiculously over-priced, while others aren’t worth half the asking price. Graphite is the way to go. Six to seven foot lengths are great for casting. Use 10-12 foot graphite rods for slow trolling and tight lining. Match rod and reel for balance. New graphite innovations are being marketed everyday. Look for fast trolling rods that feature an extra strong backbone in length up to 16 foot. Last of all, new advances in tackle storage make being organized easier. Soft-sided tackle boxes with interchangeable storage boxes give you flexibility. Besides that, they make you look cool. I do pray each of you had a great Christmas and hope to see you on the water in the New Year. Do we dare to dream dreams through our traditional New Years resolutions? Why is reality preferred over ideals? If dreams and ideals were never made into reality, what good would ever be done? So many of us have stopped dreaming, formulating ideals and even making resolutions. Those that do don’t seem keep them through the whole year, even though our intentions are the best. Most resolutions are usually tailored to self-improvement. Personally, I want to loose about 20 pounds and become more physically fit. Typical, right? But I also have resolutions specifically related to the passion in my life – fishing. This year I resolve to fish smarter, not harder. I also resolve to take at least three different people with me who have never fished or caught fish before. Cohutta from Paris , TN told me, “My New Years crappie resolution is to some how persuade (trick) my wife into letting me buy a boat.” Sounds like Cohutta’s got his work cut out for him. “I want to try to enjoy every trip. I want to just have fun and laugh and not stress over things.” Sounds like Crap-King has the right idea. I resolve to help as many people as I can make their dreams reality. One of the biggest misconceptions about crappie is that the blacks are the males and the whites are the females. When, in fact, they are two separate subspecies of the sunfish family. Taken together, they are the third most sought after class of fish overall, ranking behind only bass and catfish. But, by far, they are the most popular panfish in North America and serve as excellent table fair for millions. The white crappie, pomixis annualaris, also known as white perch or sac-a-lait (if you’re from Louisiana ), have black, spotted scales grouped in vertical bands on their body. The white crappie’s body is more elongated than the black crappie and silvery to silvery-green in color, depending on water clarity. Their dorsal fin has no more than six spines. And, during the spring spawn, the male white crappie’s throat and gill plates will develop a dark coloration. White crappie are nest builders, like other members of the sunfish family. Like the bluegill, white crappie have a very high reproductive potential. Thus, overpopulation and growth stunting in small ponds and lakes are common. White crappie nest in the spring when water temperatures reach mid to upper 60’s. Their fry hatch in three to five days, depending upon water temperature. They remain in the nest for a few days more, locked in a substance from the eggs. After this, they free themselves by vigorous swimming and begin to feed on microscopic animals. When they reach the fingerling stage, they school in large numbers. Typically, white crappie grow three to five inches the first year and reach maturity by the third year. The black crappie and the blacknose crappie, pomoxis nigromaculatus, also known as papermouth or calico bass, have irregular black, spotted scales on their body. The black crappie is deeper-bodied than the white and is also silvery-green in color. Their dorsal fin has seven or eight spines. And, just as the white crappie, the male develops a dark coloration during the spawn. Like other members of the sunfish family, black crappie are nest builders. They nest in the spring, generally when water temperatures reach the lower to mid 60’s. The biology of black crappie is very similar to that of white crappie. Growth in terms of weight is very similar between the two species. White crappie tend to have higher growth rates in terms of length, but black crappie are more robust in body construction. Now, what is a blacknose crappie? A blacknose crappie is just a black crappie with a wide, dominant black or chocolate-brown stripe running from the top fin to the tip of the nose. Blacknose crappie are a genetic variation of the black crappie and not a hybrid of white or black crappie, nor are they a subspecies. Many game and fish departments use this genetically mutated crappie for stocking, which lends to ease of measuring case study results. It has been my experience, the blacknose crappie seem to be more aggressive. Now, here’s my take on responsible harvesting of crappie. I have been informed that a young ten-inch female crappie will lay about 10,000 eggs, whereas, a 14-plus-inch female can lay as many as 200,000 eggs. I also know that it is the male that makes and guards the bed. Therefore, during the spawning season only, if an angler releases all males and large females, our area lakes should never become crappie poor. Selective harvesting during the spawn is key to each successive year. An entire library of books can be written about fishing line. However, I hope to provide in this short column a basic understanding to better equip readers in making their line choices. The three basic line types are monofilament, fluorocarbon and braided. Each have their own pro’s and con’s and tailor themselves uniquely to a specific task. There are also four basic specialty classes within each type that perform a specific job for the angler. When choosing your line, first determine what specific task best fits your fishing needing. The traditional monofilament line has a high stretch capability, excellent for absorbing high impact strikes without breakage. However, mono’s shortcoming is a large line diameter to test rating ratio. The larger the line diameter is, the less sensitive and more difficult the presentation becomes. Newer, more innovative fluorocarbon lines have many of the same characteristics as monofilaments with the added benefit of disappearing when submerged in water. A fluorocarbon line is specifically made to react to and change color in sunlight. The angler can easily see the line when exposed to sunlight, but as the line plunges deeper into the water where light is impaired, it becomes invisible to the human and fish eye. Since fluorocarbon lines are made to react to sunlight, they are more sensitive to the sun’s harmful UV rays. Ultraviolet light breaks down the line’s chemical makeup, making it more brittle is a shorter period of time as compared to monofilament. You’ll need to re-spool at least once a year. Braided and super-braided lines are perfect for fishing heavy cover and in situations where increased sensitivity is needed. Today’s braided lines are very strong and do not stretch. Their smaller than average diameter affords the angler greater sensitivity. A braided line may not become brittle like other lines, but they do fray with time. Once you have decided what type of line best fits your need, now is the time to determine what specialty feature will increase your angling performance. Some of your options are hi-vis, lo-vis, smooth casting, heavy cover, low memory, super sensitive, no twist, no stretch, and no memory. You can now take a breath! There are certainly many options from which to choose. If you’ve ever tried to crappie fish during the winter, then you’ve probably wondered why they’ve seemed to disappear. Be assured, they are still there, and probably there by the thousands. When the crappie gather at the banks in the shallow water to spawn, locating and catching them is easy. What’s more difficult is finding them during the dreaded winter months. And, when you do, you’ll reap the reward of catching bigger crappie. For this latitude and climate, I consider the winter crappie season to be from mid-November to about mid-February. The days are shorter and the nights are colder, causing the water temperatures to drop into the 40’s and 50’s. It is during this period that the crappie will retreat into the haunts of deeper water. Of course, deep is relative to the body of water you’re fishing, but generally it can always be found near the main creek channel of the lake or reservoir. In and near this deep water main channel, the crappie will be. You will find and catch crappie in one of two extremes – deep, in the bottom third of the water column, holding close to structure and cover or shallow, in the upper third of the water column, scattered. When locating the deep crappie, use your sonar graph. Turn up the sensitivity so you can distinguish between bottom clutter and fish. Once you’ve located them, throw a marker. Fish slowly and methodically. If you’re using jigs, don’t forget to use a dark color to compensate for the low light level. Be patient. Crappie holding tight to structure or cover, deep within a creek channel, are not actively feeding. Experiment with jig colors and combinations. Test various jig sizes and depth of your presentation. Make micro-changes, no more than six inches up or down to get the bait right in their face. When locating the shallow, scattered crappie, fast trolling out the back of your boat is your best bet. These crappie will be actively feeding and will want a fast moving large presentation, sometimes as big as an umbrella tube or three-inch crankbait. They will be four to six feet under the surface and chasing balls of shad. Use your sonar to stay in or near the deepest water and to locate the shad. The shad wrapped in a tight ball will usually have a predator near by. Use your GPS to maintain your trolling speed. Generally, .8 to 1.5 mph makes a perfect presentation. So many excellent crappie anglers miss some of the greatest fishing opportunities when they only fish during the spring spawn. Winter crappie fishing will become your favorite, when land that three-pound monster. Single pole jigging for crappie is exciting. The “thump” is what I live for and always makes adrenaline rush through my veins. But sometimes, you just can’t target the fish. So, the best technique to use is trolling. Both, fast and slow trolling give an angler the opportunity to cover more water for those finicky, scattered crappie. Slow trolling, sometimes called spider rigging, is a technique where an angler or a pair of anglers, sitting side by side, fan as many as eight long rods in rod holders from port to starboard across the bow of the boat. Rod lengths range from 10 to 16 foot, depending upon the angler’s preference. Some slow trolling experts use up to five hooks or jigs per pole. My preference is only two. Using a 36-inch segment of 8-pound test line, tie on an extra-light wire minnow or cricket hook or a 1/32 or 1/16-ounce jig hook. This is your bottom hook. Next, secure a 3/8 to 3/4-ounce egg sinker six inches above the bottom hook by looping you line through three times. Now, tie a three-way swivel on the opposite end. Last, tie another hook with a six-inch leader to the second leg of the swivel. Terminal rigs like this can be made in advance of your trip and easily stored by wrapping it around a two-inch segment of foam. I cut mine from a round swim noodle. Slow trolling speeds are usually less than one half mile an hour. The faster you troll, the greater the weight needed to keep your lines as vertical as possible and out of your trolling motor. Go slow. Boat control is key. Identify on your sonar unit what depth the fish are holding and drop your bottom hook to that depth. Fish on and pray they all hit at the same time. This is not a lazy way to fish. Fast trolling, sometimes called long lining, is a technique where anglers use up to eight rods to drag crank baits out the back or from the side of the boat at .8 to 1.5 miles per hour. My preference is the Bandit 300 because they float and offer and large three-inch presentation. If you choose to try this technique, will need to use 7.5-foot heavy action rods with bait caster reels that have a decent drag system. You will also need a line counter device to identify exactly how much line is let out. A bandit out 200 foot pulled at 1.5 mph will swim about 12 foot deep. The shorter the line the shallower the bait will swim. When trolling directly out the back of the boat, be very careful to make extremely wide turns. The outside baits in a turn will start to run faster. The inside baits will run slower and begin to rise. The final result is a huge tangled mess. Make wide turns. When fast trolling from the side of the boat, use four rods staggered at different heights. Your back rod should be pointed down toward the water. The forward most rod should be pointed up at a 45-degree angle. The two center rods can split the difference equally between the front and back rods. Place and set your back rod first by letting out 200 feet of line. Work your way forward letting out 50 less feet of line than the one before it. This will bring all your baits in a staggered line and if the fish misses the first or second bait, it will hammer the next. Plus, all your baits will be swimming at a slightly different depth to better cover the water column. Fast trolling is excellent for catching monster crappie. Don’t be surprised if you also catch your share of catfish, walleye and bass both in the black and white species. This is not an inexpensive way to fish, but it is very effective. I called the Arkansas Game and Fish Commission and was told that we do not have a general statewide rule that limits the number of poles and number of hooks a single angler can use. There are, however, rod and hook limitations on specific bodies of water. Always check your state regulations first. Habitat is the natural environment of plants and animals. It can also be a controlled environment. Basically, the habitat for crappie is where they live and can be found. For the next several weeks, I will attempt to inform you about crappie habitat, both natural and artificial. In the end, I hope this information makes you a better angler, able to fill your limits often. But, before we proceed, let us focus our attention on rules, regulations and responsibility. According to Sam Henry of the Arkansas Game and Fish Commission in Jonesboro , there are no specific regulations limiting or restricting placement of man-made, artificial cover in lakes managed by the state. In my own experience, other bodies of water, such as Corps of Engineer lakes, regulations do apply and permits may be required. On these waters, check with the proper authority first, before placing any structure. Next, let me challenge each angler to be responsible and a good steward of our natural resources. Do not fill our lakes with trash. Any component that can produce or become a toxic byproduct, contaminating the water, should be avoided and not used. Common sense should prevail. When it does, together we can improve the habitat for future generations. Now that the formalities are complete, let’s turn our attention to crappie’s natural habitat. Understand this first, and then you’ll know where best to place your man-made cover later. Crappie relate to structure and cover. The two are different and work together to form habitat. Structure is underwater geography. Primary and secondary creek channels are structure. Ledges, humps, points, flats, even a large boulder or formation of rock are all structure and can hold crappie. Cover is everything that is not structure. Water vegetation is cover. Trees, stumps, lay downs, and brush piles are cover. All these, plus man-made cover, provide a place for crappie to hide and ambush their prey. Cover is what you get hung up in when fishing and structure is what the cover sits upon. When fishing, seek out both structure and natural cover to find crappie. Use a map, when available, to find key structures. Use a sonar unit and GPS to locate and mark structure and cover. Now, lets put the two together in some real examples. Norfork Lake is predominantly deep water. However, there are ample number of ledges with lay downs. Not only look for the Corps’ fish attractor signs that mark large brush piles, but also spot the cuts where water runs off into the lake. These ledge structures will accumulate dead wood and hold crappie. The Arkansas Game and Fish have done a fantastic job of creating habitat in this lake. Maps are available and if you wish to read more on the subject, visit www.ozarkmtns.com/fishing/species/crappie.htm. Next week, we’ll continue with Lake Charles and Poinsett and start on man-made cover. Last week, we started our discussion on the crappie’s natural habitat. We identified the differences between structure and cover and how together they form excellent habitat for targeting crappie. We finished last week’s column with specific examples on Lake Norfork . In addition, Lake Charles , south of Black Rock, has two large, distinct stump fields that provide excellent natural cover for crappie. One is on what locals call “rock bank” and another along “mud bank.” Plus, the upper end of the lake and each cove are flats that house their share of stumps for crappie to take cover when spawning. Target these areas and you’ll locate the crappie. Visit the lake while it is at winter pool and you will see much of what I just described. Don’t forget, Lake Charles now has a 10-inch length limit on all crappie. Lake Poinsett , near Harrisburg , is a simple lake with much variety. On the north end of the lake, there is a very distinct ditch with a few brush piles scatter on its lip. Near the opening of camper’s cover there is a fencerow of stumps that line the edge of a secondary creek channel. A well-defined point, with several brush piles scattered throughout, extends from east cove to the edge of the primary channel of the lake. These are but a few structure/cover combinations that make perfect habitat where you can target crappie. Visit my website at www.familyfishingtrips.com to see maps of both Lake Charles and Poinsett. Each marks the structure and cover described above. I’ve heard told more than once, “if you’re not fishing the wood, you’re not crappie fishing.” This is true. This is the crappie’s habitat. It is where they live and where they can be found all year round. Now let’s turn our attention to man-made or artificial cover. Freshwater fish attractors concentrate fish by providing cover, structure and spawning habitat. Often, the angler provides that cover in the form of a brush pile or other structures assembled from man-made materials. Location is key. An incorrectly placed fish attractor will produce nothing. The best place to locate man-made cover is in close proximity to deep water. Sites located off points near creek channels (the crappie’s highway) are excellent locations. Remember this, if you’ve caught crappie there before, you just might be able to attract more by adding a little cover. Strategically place your fish attractors at different water depths to perpetuate year-round fishing. In the heat of the summer and cold of the winter, crappie will mostly be found in the deepest water. During the spawn they are in the shallowest water. Don’t omit the transition and staging areas between deep and shallow water. Let me restate my challenge to each angler to be responsible and a good steward of every crappie habitat. Though there are no specific laws prohibiting the placement of man-made cover in our state lakes, do not fill our lakes with trash. Be selective and let’s do it right. If, today, we do a good job, then tomorrow’s habitat will improve for future generations. Next week we will discuss different types of artificial cover like brush piles, stake beds and a unique system invented here in Arkansas called the crappie condo. Last week, in part two of our discussion about crappie habitat, we concluded by describing the proper placement for fish attractors. This week, the final column, we’ll identify types of artificial habitat and how best to build them. The brush pile is probably the most basic of cover. And, the Christmas tree is probably the most commonly used. Christmas pines are dense cover and work well for baitfish and crappie fry when sunk in the shallows. Their shortcoming is the smaller branches will decompose in a short time. Therefore, you should sink as many as is reasonable in one spot to form a single pile after the smaller branches disappear. Another alternative is to drill a 3/8-inch hole at the base of the tree and push a steel bar into the hole. Place the tree’s trunk in a 5-gallon bucket filled with concrete. Let it dry over night. The extra weight at the bottom keeps the tree upright. Strategically place them off points at the mouth of coves to create a perfect transition from deep to shallow water. When the tree is rotted away, usually only after a season or two, the bucket will remain and serve as an artificial stump. Hardwoods make better brush piles and they last much longer. Don’t expect too much too soon. They will sour at first and require a longer period of time to begin to attract crappie. Find the best structure that will hold crappie naturally, like a creek channel, point or ledge, and sink it there. Make your pile at least 20 feet long and half the height of the water column when at draw-down. Use rocks or blocks tied to the wood to keep it on the bottom. A hardwood brush pile is a long-term investment you can add to and improve upon for years. Stake beds are excellent cover for spawning crappie. There are two schools of thought concerning stakes. One believes the stakes should never extend more than two to three feet above the bottom no matter the water depth, whereas, another says the stake should always rise through at least half the water column. In either case, drive a boatload of them into the bottom of the lakebed creating a field of them in strategic locations. Another way to make stake beds is to nail them to a pallet and sink it. Now, the best for last – Jerry Blake’s Crappie Condos just can’t be beat. Jerry is a very good friend and fellow guide – www.actionfishingtrips.com – who continues to teach me. His crappie condos, as he calls them, are inexpensive to build and last for years. You may wish to get a partner to help because they are BIG. To make a crappie condo, you will need a 5-gallon bucket, some concrete mix and 12 to 15 or more pieces of fresh cut, green bamboo – leave the leaves on – bushy is better. The length of the bamboo will vary depending upon the depth of the water. His are usually eight to fifteen feet long and sunk in 25 to 35 foot of water. Mix the concrete in the bucket and place as many your bamboo in the bucket, fanned out and pointing in all directions. Let it set over night and they’re ready to sink. It’s just that simple. They attract crappie very quickly, sometimes within mere days, and are more forgiving with hang-ups. The bamboo is buoyant, but the concrete-filled bucket sinks perfectly upright, even on the steepest of slopes. If you would like to read detailed instructions and techniques for building crappie condos, visit www.crappie.com/condo. Last of all, don’t forget to use your GPS unit and mark a waypoint where you put the cover. This will allow you to return to the exact spot. You might wish to share the coordinates with a few friends – like me. Well-managed habitat will produce grand numbers of crappie. Concentrating and targeting crappie in this manner is a key to filling your limit every time you fish, no matter the season. So, anyone with a little bamboo, a few buckets and some concrete, give me a call and we’ll make the world’s best attractor for the world’s best pan fish. Though the temperature is still flirting with the freezing mark each morning, it’s beginning to warm up more and more during the day. That means it’s time to get serious about spring crappie. Some anglers believe crappie to be irrational and unpredictable. This is so untrue. Experienced crappie anglers know that water temperature is the single most influential factor governing crappie behavior. Fish are cold-blooded creatures and the slightest change in water temperature triggers their feeding and breeding activities. When you match water temperature to activity, and then activity to location, crappie then become predictable and your freezer fills up. During the winter season, water temperatures sometimes drop below 45 degrees. During this period, the crappie are scattered in the deepest water. Their bite is generally very light with an overall activity level some might consider hibernation. In reality, they are just conserving energy and waiting for the time when instinct drives them into feed frenzies. When the water temperature warms to the 50-degree mark, the instinctual migration begins. Crappie move out of their deep water haunts in the main lake body and begin to concentrate near the entrances of primary creek channels. By the time the temperature finally reaches 55-degrees, they will have moved closer to the shallower secondary channels. It is the primary and secondary channels that crappie use as a highway or migration route. Slow trolling or drifting these channeled staging areas can be very productive. Another productive method is casting across the channel and, with a stop-and-go presentation, retrieve your jig at varying speeds. Use a count-down method to control your depth. They also form the advanced party into the shallows. Here, the male crappie locate and fan out spawning beds while the females wait in the before mentioned channels. During this time, both male and female crappie feed aggressively, increasing an angler’s opportunity to easily fill a day’s limit. The male crappie’s aggression can also be triggered during this time by invading its bedding territory. This is my favorite style of crappie fishing. Glide up into the shallow water and pitch or daub a jig around stickups, lay-downs, and brushpiles. Sometimes, it will hit your jig so hard and fast you think it might take the pole right out of your hand. If you wish to fish this way, I recommend you do the following. First, set the hook with a side pull motion and not up. This will prevent spooking other crappie, drag it out of the brush quickly with fewer hang-ups and stop it from jumping. Second, when you catch a crappie, always go directly back to the exact same spot. Last year, I caught a 15-inch male and a 14-inch female off the same bed. Last, when pitching, swimming the jig back at a constant depth is essential. Baitfish swim straight, not up and down in roller coaster fashion. Mark your line using a permanent marker about 18 inches above the jig. Keeping this mark at the water’s surface, ensures you are swimming the jig straight and at the correct depth. As a general rule, once the water’s surface temperature reaches the mid-60’s, the spawn is in full swing. Back and forth, the crappie go between staging and bedding. The females will be in the staging areas or on the bed laying eggs. The males will be protecting a bed or retrieving a female from the staging area. By the time the temperature enters the 70’s, the females stop spawning and begin their migration back to deeper water following the same route. Soon thereafter, the males will retreat. When the water temperature is in the 80’s, you can know they have made it all the way back to the deeper, cooler water. Please remember, water temperature, activity and location are inter-related. Of course, exceptions always apply, but I sincere hope this information helps you better target crappie. My favorite online crappie fishing forum, www.crappie.com, has recently gained at least a dozen new members, proclaiming they are new to crappie fishing and want to know how to get started. They have inspired me to write this for you. The first thing a new crappie angler must do is decide just how much you are willing to invest into the sport. Crappie fishing, perhaps, may not be as expensive as today’s popular bass angling, but it will consume as much, if not more, of your time. You must decide if this is really what you want. Because, once you start, you’re going to be hooked. Crappie fishing is more addicting than nicotine or some other drug. It’s a passion that is never fully satisfied. If your decision is in the affirmative, then the next thing to do is study. Purchase books and magazines that are specific to the sport of crappie fishing. There are several books available that can be purchased at any major bookstore or online. I recommend them all, but you might first try Crappie Wisdom by Al Linder and Ultimate Crappie Techniques by Samuel L. Calvin. Crappie World is the only magazine I know of that solely dedicates itself to panfish. Now that you have read and thoroughly familiarized yourself with the sport, hire a guide. Hiring a guide is not an expense, but rather and investment. Hire a guide that is willing to not only take you fishing, but also able teach you everything you need to know. You can learn from a guide in only one or two trips what he learned over many years. A good crappie guide can show you firsthand how to rig your terminal tackle and what to look for on the water. Some guides will even give you a GPS coordinate or two to help get you started. A guide is a mentor, coach and friend. Every good guide has at the core of his business the success of his clients. Now all you need is your own equipment and some experience. Start with the basic equipment – boat, rod, reel, terminal tackle, bait and net. Any boat that will safely float will do. You will want a trolling motor and basic fish finder. Later you will want to add a GPS unit to your electronic tools. If you are going to tightline, troll, drift or use slip floats when fishing for crappie, I recommend a 12-foot graphite crappie rod with a basic open-faced spinning reel. You can expect to pay between $30.00 and $80.00 for the rod/reel set. If you prefer to cast for crappie, I recommend a 6 to 7 foot graphite ultra-light rod. Use 6 to 8 pound test monofilament line with 1/16th ounce jig hooks and 1½-inch tube jigs or extra light wire Aberdeen hooks for live bait. When using a slip float, I prefer the half-inch pencil style with two appropriately sized split shots that will stand the float upright, but not sink it below the water’s surface. There are literally millions of jigs types, styles and colors. The tube jig is probably the most basic and productive. Color is important, but not so important to keep you off the water. Pick anything with chartreuse color in it. A wise man once told me, “A blind hog will get an acorn every once in a while.” There is a difference in luck and skill. If you start with the basics and fish often, you will not need to rely upon luck for your fishing success. Depending upon the amount of time and effort you contribute to the sport, you can become a skilled crappie farmer able to find and catch the world’s best panfish any time of year. Go with what you know. That is the best advice I have ever received. As it relates to crappie fishing, you should fish familiar waters with equipment you are accustomed to in a manner that is comfortable to you. Recently, I was privileged to take a father and his son fishing. Admittedly, both were novice fishermen and required generous amounts of tutelage. The father was not overly interested in fishing. The son, however, was relentless and proved to be a quick study. This 14-year-old enthusiast fished with every rod in my box in every manner known to man. His zeal was inspiring. For over four hours he tirelessly cast spoons and crankbaits, while keeping one eye on two slipfloat rigs. It was a very slow day on the lake. But, due to sheer determination, he landed six, keeper crappie, besting his dad’s two. The point is they fished to the best of their ability, not caring that the spinning reel was upside down and they had great day on the water. Wow, what an object lesson. Go with what you know. Fishing unfamiliar waters tests your knowledge and skill of the sport beyond normal tolerances. However, productive harvests of crappie tend to occur more frequently when you fish a lake, pond or river you know. For example, there are an ample number of great crappie waters here in the immediate vicinity of Paragould. Nonetheless, I drive four hours south, to Hot Springs, most weekends to guide and fish lakes I know. Doing so, allows me to offer a guaranteed catch. Familiar waters give you confidence. All too often, outdoor writers and fishing professionals promote the latest and greatest in today’s tackle and equipment leading some to believe you won’t catch another fish without it. On the one hand, there are many products on the market today that are worth their weight in gold and make the angler’s job easier and more efficient. On the other hand, an angler may tend to believe that if he had the new graphite rod with the latest in reel technology spooled with super-invisible fluorocarbon line baited with a red-light flashing, crawfish impregnated, imitation minnow, then he would have filled his limit. This is not necessarily true. Sometimes, the best crappie catcher is a simple cane pole with small red ribbon tied to a hook. Using tackle and equipment you are accustomed to allows you to spend more time fishing. If you are spending half your time learning the new fishfinder or fighting that new trolling motor or re-spooling that new reel, you just might miss the most productive fishing time. Learning new presentation techniques is a great way to improve your angling skill. However, that new technique may not be right for you. If you are comfortably confident trolling for crappie, then spend your time trolling. As for me, I am more productive hovering over a specific brushpile and tightlining a jig or dangling a minnow under a slipfloat. I enjoy casting for crappie and like to experiment with it, but the fish caught are fewer in number. Go with what you know. Do this the majority of the time. Experiment some of the time. Just remember, you can’t have everything and do everything at the same time. WHAT AM I SEEING ON MY SONAR SCREEN? Think of your sonar screen as a composite picture of individual sonar returns. The transducer sends intermittent sound waves or “pings” down into the water and records how long it takes for each ping to return to the transducer as well as how loud that signal is when it comes back from the bottom or other object. The sound waves are broadcast into the water in a "cone" or circle that is narrow at the transducer and widens until it meets the bottom. Only objects that are in the cone or view of the transducer can be detected and displayed on your screen. Think of each horizontal pixel on your screen as one ping or one still photograph of what was in the cone at that instant and how far that object was from the transducer (depth). Think of each vertical pixel as one volume setting. The louder the ping comes back the more vertical pixels it will “paint” depicting higher volume. More vertical pixels means the sound wave bounced off a harder, thicker or denser object. The display on your screen is simply a short history of what your transducer passed over or what passed under your transducer. The most recent information comes into view on the right side of your screen and then moves across and off your screen to the left. Depending on your boat speed and Scroll Speed (speed at which information passes across your screen), what you’re seeing on your screen, especially as it approaches the left side of the screen, isn’t necessarily under your boat and can actually be quite a ways behind you if you’re moving very much at all. In order to get “fish arches” that sonar manufacturers lead us to believe we should be seeing, either the boat or the fish must to be moving at a pretty good clip – a lot faster than most of us move when we’re crappie fishing and a lot faster than crappie move most of the time. Arches are created because as a fish passes through the “cone” of the transducer it is farther from the transducer when at the edge of the cone and closer to the transducer when in the center of the cone. The width of the arch depends on several factors including, cone angle (width), how deep the fish is, how fast the fish passes through the cone and also how fast your Scroll Speed is set. The cone angle affects fish arches because at a given speed (boat or fish) and Scroll Speed it takes longer for a fish to pass through a wide cone than a narrow cone at any given depth. The varying depth of fish also affects the arches because the cone gets wider as it gets deeper so the deeper a fish is the longer it takes for it to pass through the cone and visa versa because of the difference in the distance across the cone at different depths. The faster a fish passes through the cone and/or the slower your Scroll Speed is set the shorter the arch is going to be up to the point where it is just a blob instead of an arch. The slower a fish passes through the cone and/or the faster your Scroll Speed is set the longer the arch is going to be up to the point that it goes all the way across your screen. If you get over an active school of fish that are moving up and down in the water column you’re going to see lines that go up and down your screen like a bunch of snakes. Crappie however are not usually that active and if you’re sitting still or moving very slowly over a brush pile you can expect them to show up as solid lines across your screen rather than arches. When a fish moves up or down in the water column the line will move up or down accordingly as it scrolls across your screen. One of the most crucial adjustments on your sonar is Sensitivity. With Sensitivity properly adjusted you can distinguish between cover and the bottom because wood, bamboo, weeds, etc. have a different density than rock, silt or mud. Knowing what type of cover you are over, either because you put it there, you’ve looked at it with an underwater camera or you’ve seen it when the water level was down, is very beneficial in learning to identify what you’re seeing on your sonar. You can distinguish between fish and cover because fish have a different density than wood, bamboo and weeds, etc. Bigger and shallower fish will show up as thicker lines because the ping comes back louder than it does on a smaller or deeper fish but each fish will show a consistent thickness or volume as the sonar return is displayed across the screen. If these solid lines going across your screen move up or down you can be sure it is fish you’re seeing and not branches. Tree limbs vary in thickness and therefore show up with an inconsistent thickness or volume and they don’t move up and down in the water column. HOW DO I ADJUST SENSITIVITY FOR OPTIMUM PERFORMANCE? First, make sure your transducer is pointing straight down and be sure there is no oil or wax residue on the face, which could cause small air bubbles to stick to the face and interfere with the sound waves. Also, make sure you have a good connection where your transducer cable connects to your graph - there should be no moisture or corrosion in this connection. Turn your Fish ID off and suspend a 1/16th-ounce jig 10 to 15-feet deep and in the view of your transducer. Then move the jig up and down a foot or two at a time. It should show up on your sonar as a line that moves up and down on the screen just like you’re moving the jig. If you don’t see your jig, slowly increase your sensitivity JUST until it starts to show up as a very faint line. If your jig shows up real dark then reduce your sensitivity until it only shows as a very faint line. Now your overall sensitivity should be about right but you can make minor adjustments from there if needed. Most sonar units have an “Automatic Sensitivity” setting, which adjusts for different water conditions and depths. Even with the Automatic Sensitivity turned on you should be able to manually set the desired sensitivity range. The Automatic Sensitivity should then make adjustments for different depths and conditions so your display is more consistent. If you’re going to use your Automatic Sensitivity then be sure it is turned on before you make sensitivity adjustments. However, on some units you may have to switch to Manual Sensitivity to maintain the sensitivity level you want. Many units (Lowrance in particular) filter out actual sonar returns that are “identified” as fish and replace them with fish symbols when “Fish ID” is turned on. In that case, you may not be able tell whether you’re seeing one fish moving up or down or several fish holding close together at different depths. In that situation you’re better off keeping the Fish ID turned off. If you are going to use your Fish ID turn it back on after you have adjusted your overall sensitivity. Now move your jig up and down as before. If you’re sonar shows fish symbols along with the line depicting your jig then reduce the Fish ID sensitivity (if available on your unit) just until your jig no longer shows as fish unless you want very small fish to show up as fish symbols. With even an “entry level” sonar properly adjusted you should be able to move over a brush pile or other cover and quickly determine how deep the bottom is, how tall the cover is, whether or not it is holding fish, how deep and active those fish are and how closely they are holding to the cover. With that information you should know about how deep to start fishing. If you’re not marking very many fish and don’t get a bite within a few minutes knowing that you are presenting your bait at the correct depth then it may be time to move on. On the other hand if you are marking a lot of fish all up and down the water column you may have to try several different depths to determine which fish if any are actively feeding. Taking time to learn how to properly adjust your sonar and to identify what you’re seeing on the screen should save you a lot of time when searching for hungry crappie and help you put a lot more of them “in the box”. Though modern technology is not a necessity, when applied it certainly can make things easier, more efficient and reap profitable results. You hit the water at first light for a full-day of fishing. Everything is perfect – bait, boat, beans and beverages. You motor down the lake to your first spot. It’s a nice brushpile you made yourself sunk in 15-foot of water on the inside bend of a secondary creek channel and you’ve always found it when you line up that ole knotty pine with that forked gum tree behind it. After a few minutes of spinning the boat to the left and then again to the right, you finally catch the edge of the brushpile and see it on your fishfinder graph. Hey, there it is and hope you haven’t spooked all the fish out of it while looking for it. You do this all day for every spot. On a full-day’s fishing trip, you end up spending an hour or two total time searching for the brushpiles instead of fishing them. The day was good because you brought home enough for supper. But what if you were able to get on all your brushpiles faster and more accurately and spend the time saved fishing instead of searching? Hey Honey, can I buy a GPS? A what? A GPS, you know . . .!!! There have been many posts asking about GPS units, how to use them, etc. Knowing where that honey hole is and getting in the strike zone faster will put more fish in your livewell. I hope this post will help you use your GPS to do just that. Many crappie.com posters have GPS units and know how to use them, but there are some out there who don’t and hopefully this post will give them some help and confidence to utilize the technology. Now, here are the nuts and bolts of how to use it when fishing. I will use names and terms as it relates to my Garmin GPS Map76, but no matter your brand of GPS, it will have the same functions. Just think of a GPS as an electronic map where “X” marks the spot. The “X” is a waypoint. Every GPS has other functions like compass, tracking, routing, but it is the “map mode” that we’re interested in. The map screen whether you have an enhanced map installed on your GPS or not is still the map screen and is where you will use your GPS 99% of the time. I do not have one installed on mine. It’s just a blank screen with a triangle in the middle (that’s you and your position or more accurately, your GPS’s position). The “in” and “out” buttons allow you to zoom in as close as 20-feet and out as far as 800 miles. I use mine in the ranges from 30 to 200 feet. “Page” over to your map screen. A waypoint is the saved coordinate (longitude and latitude) of any given spot. For example, the very spot where I am sitting right now writing this post is N 34 27.073 W093 02.875. To save a waypoint, hold down the “enter” or “mark” key for several seconds, not the “NAV” or “MOB” (man overboard) key. That’s another feature for emergency marking and immediate return navigation. A screen will show with the waypoint icon, name, longitude/latitude coordinates, date, etc. These data fields can be edited or saved as is. You can give the waypoint a specific name and icon or you can go with the default icon and number. Continuing to save with an “enter” on the “okay” saves the waypoint in your GPS’s memory, and then return to the map screen. If you were zoomed in to the 20 or 30 foot range on your map screen and walked away from that spot, you would see the waypoint icon move away from your triangle, and vise-a-versa back to your position when you walk back to that spot. When in the map mode you could drive across town (the waypoint would disappear off your screen), buy some new fishing tackle and come back to that spot and your waypoint would show back up on the map screen. Nothing else is required. The GPS does all the work. When in the boat and you’re sinking brush or you’ve found some brush, use markers or whatever is necessary to get dead center on the spot you want and allow your GPS to catch up or settle. Save the waypoint. Remember, the GPS will save the exact coordinate of its exact location. If your transducer is on the transom of your boat, your graph is showing the brushpile and you’re sitting in the front of the boat, your waypoint will be that many feet away from the spot you want to save and find again. Using the GPS for general location is not using the unit to its potential and you’ll still be hunting your brushpile like before when you didn’t have a GPS. The waypoint should put you right on a deep brushpile in seconds and help you stay off shallow brushpiles so you don’t spook the fish. Now you have all your waypoints saved. And, you know the general location of each little honey hole you’ve made or found. How do you get back to that spot and use the GPS to do it? This is where many start to over-complicate it. One mistake is trying to use the “Go To” function. The “go to” is for navigation to an unknown waypoint. You already know the general location of your fishing spots, so just boat to them with your GPS on the map screen. Zoom out to 120 or 200 foot and when you’re within that range of the waypoint it will show up on your screen. Drop the trolling motor and start driving to the waypoint. Keep zooming “in” as you get closer until you’re on the 20 or 30 foot screen. I use the 30 foot. If you’ve got a good waypoint, dead center on your brushpile, it should start to show up on your sonar unit as the triangle (your unit’s position) covers the waypoint icon on your map screen. Just take note of your zoom setting. If you remain zoomed out several hundred feet it would appear that you’re on the spot but when you zoom in tight you might find you’re not exactly on the spot yet. And, sometimes if not most times as little as five foot makes a big difference when on the water. Throw a marker buoy off the brushpile and up wind to give you a physical reference on the water as to where the brushpile is and fish it thoroughly. Your sonar unit will tell you where on the brushpile the fish are (the dining room as Jerry calls it) and how deep they are. FISH ON. Run and gun to the next spot, use the GPS to get you right on the spot. No more searching and telling yourself, “Well, I know it’s here somewhere!” You’re on it literally in seconds and ripping a lip before your fishing partner has time to re-bait his hook. Now you can sink, find, and fish with confidence very specific spots out in the proverbial middle of the lake as easy as you can those close to the bank. Now you don’t have to make mental adjustments for lake level to find that honey hole. A saved waypoint with the GPS in map mode will put you on it every time. Now you can explore and discover new honey holes and know with certainty you can come right back to it and find it. Many anglers limit the time they crappie fish to the spring spawn and the fall feeding frenzy. This only accounts for as little as four to eight weeks of slab hunting per year. Further, they limit the places fished to shallow water with visible cover. This is logical. Visible cover in shallow backwater coves holds ample crappie during the spawn and it’s easy to fish. But why do so many crappie anglers not fish or not catch fish when the spring spawn or fall feeding frenzy is over? Why not crappie fish during the summer and winter and be just as productive? It undoubtedly is more of a challenge, but why do so many crappie anglers shy away from fishing deep, clear water reservoirs? Why do so many really good crappie fishermen have trouble finding and fishing submerged cover they can’t see? I personally witness this particular phenomenon in locals who have fished for decades the lakes I guide upon. There are many reasons, too numerous to list here. However, I hope to inspire you to take on the challenge, venture out into the deeper waters, test the confines of what you can’t see and land the fish of your dreams year-round. As the water warms up during the summer and when it becomes cold in the winter, crappie will seek the safety and comfort of deep water. Deep water for the purposes of this article is 20 to 40-foot. Though crappie may school and suspend in open water during these so-called off seasons, they will most definitely reside around cover like brushpiles, fish habitats and even rock piles in deep water when available. In order to find this fish-attracting cover, use your fishfinder sonar unit. Start looking in, on and around the two most ideal structures for such cover -- primary and secondary channels and submerged points. When you find the cover, or you place the cover there yourself, use a marker buoy to identify its relative location. Quietly return to the spot and pinpoint the cover’s exact location by watching your sonar unit. Set a waypoint on your GPS unit so you can return to the spot on a future date. If you use a sonar unit with at least 240x240 pixel resolution and its sensitivities are set correctly, you should be able to clearly identify the bottom, the cover sitting on the bottom and the fish in and around the cover. Now it’s time to fish in that very specific spot holding the fish. You must get your bait into the strike zone, at the correct depth, with the most effective presentation method in order to harvest your share of crappie. More times than not, you can be as little as five foot outside of that proverbial sweet spot and not get a bite. Work around the cover and find the feeding fish. Moving off the cover, casting over it slowly retrieving your jig or minnow through the cover can be effective but it often results in too many snags and less time effectively fishing in the strike zone. Slow trolling, fast trolling, and spider rigging are all valuable methods, but are not totally suited for fishing one specific brushpile submerged in 35-foot of water, for example. A more effective presentation method is to “hover” over and near the cover and fish vertically controlling your boat’s position with the trolling motor. Watch your fishfinder and position relative to the marker buoy to ensure your baits remain where the fish are holding in the cover. Depth control is the key to catching crappie. Your sonar unit will identify the depth at which the fish are holding. So, put your bait where the fish are. There is no need to drop to the bottom, risk getting hung up and cranking up till you get a bite. Just go straight to them based on what your sonar unit tells you. Use of a long pole is essential to keep your line away from the boat. A 10 or 11-foot graphite is my preference. Fishing above the crappie and not below them is always more productive. One vertical method used for deep crappie is vertical tightlining, pole-in-hand. Use your favorite jig and get ready for that arm-rattling thump. Use a permanent marker and mark your line at 20-foot so you can make quick, precise depth adjustments in accordance to what you see on your sonar unit. For an added twist when tightlining a jig, you can use your offhand to grab the line, pull your jig up and pitch it out to a select area of the cover. Keep your line tight as the jig falls to its depth. Don’t be surprised if your jig is eaten on the fall. Develop a method that uses the length of your pole in conjunction with line marks or bobber stops to always know how deep you are fishing. Another very effective method for harvesting deep crappie is suspending a minnow under a slip float. Set the bobber stop to the desired depth. Varying the depth, 6 to 12-inches, on each pole will assist you in finding the exact depth at which the crappie are feeding. Use of rodholders allow you to set out two or more poles per person. Remember, you are using the boat and trolling motor to gently push, pull, and drift your baits into that honey hole. Sometimes the floats disappear right before your eyes. Other times, especially when fishing deep, the bite can be extremely light. You will be able to detect the slightest of bites when your slip float, split-shot weight and hook are balanced just right to achieve the least resistance when being pulled under. Watch for the times when your crappie picks up the weight and lays the float over on its side. It has been my experience that small balsa floats (half-inch, pencil-style) are the most sensitive and effective. Be mobile. Mobility is just as much the secret to filling your limit as depth control is the key to catching crappie. Build a portfolio of spots to fish using your GPS. A good, handheld GPS unit that is WAAS capable (Wide Area Augmentation System) will not only help you return to the spots but will also assist you with getting on the cover fast and accurately. Test multiple depths and all areas of the cover before you move. If after 15 or 20 minutes you have not caught a crappie, then run and gun to the next spot. When the crappie bite is slow and their disposition is shy, you may only catch one or two per spot. Hit ten spots and your limit is filled or at least you take a nice mess of crappie home. If you have a boat with a trolling motor, fishfinder, GPS unit, marker buoy, long pole with a pocket full of jigs or a dozen minnows with a slip float rigged and ready, you can catch crappie in deep, clear water. Use the sonar unit to find it. Mark it with your GPS and a marker buoy. Keep your bait in the strike zone. I sincerely hope my description of this simple hovering technique with basic equipment helps you conquer the complexities of fishing deep, clear water reservoirs. It works very well for me and yearly produces 1000’s of slab crappie for my clients. Each year, my partner and I host a Spring and a Fall Crappie Camp, free of charge. The setting is informal and gives each angler an opportunity for show and tell. Reading about it is good, but getting your hands on it during the event’s mini-seminars is even better. If I can be of any further help, you’d like to know more about the Crappie Camps, or wish to inquire about booking a guided fishing trip in Central Arkansas to experience firsthand what I’ve written about, visit my website at www.familyfishingtrips.com, email me at darryl@familyfishingtrips.com or call Darryl Morris at 501-844-5418. It’s the middle of January, the weather is less than favorable most days and springtime crappie catching overwhelms your mind most of the time. Not only are you captivated by the quantity promised by the coming spawning season, but also you know fishing during the winter months in colder waters can reap quality fish. You know it’s important to get on the water as much as possible to establish and maintain a dominant pattern - to follow the fish. But, there are many obstacles – the crappie widow you’re married or espoused to, the commanding schedules of the kids, the j-o-b, more weather, etc. Daily lake excursions are the best, but that’s genuinely unrealistic. So, you go as often as you can and you find that reading about how to put a pattern together is easier than actually finding it the particular day you’re fishing. Is it possible to actually and accurately predict the crappie’s behavior? Ultimately and emphatically, no, not with any take it to the bank certainty! The minute you think you’ve got them figured out, you learn the fish we love so much has fooled us again. There are so many variables when taken altogether would take the world’s largest super-computer a decade to figure out a potential pattern. Though norms may exist, truly the two most unpredictable things in the world are human nature and mother nature. So, do we give up or find a way? I say, find a way. Develop a method that will point you in the right direction and improve the odds. Willie Mays once said, “It isn’t hard to be good from time to time…What’s tough is being good every day.” Start with the conceptual and narrow it into the concrete. Often, predicting crappie behavior is like painting a work of art. You start by brushing on the background and one step at a time you add more and more detail. Eventually, you make the last brush stroke and sign your name to the masterpiece. Crappie seasonally migrate between deep and shallow water using submerged channels. Identify these primary and secondary channels using maps and sonar units. Develop a “mental” map of where the channels are and how they run. Learn where the bends and holes are in the channel. Find where the channel has sharp drop-offs and sloped banks. Granted, this may be more easily accomplished with some bodies of water than others, but crappie must move and will do so within a chosen path. Find it. The crappie are not just there scattered everywhere. If you haven’t heard this clever proverb before, I’ll enlighten you now, “ninety-percent of the fish can be found in ten-percent of the water.” Being very familiar with the highway the fish use to move in and out of their haunts is not only the start to predicting crappie behavior; it’s the very foundation that supports all the other factors. As the seasons change, crappie will move to shallow water in spring and fall and deep water in summer and winter. Of course, shallow and deep is unique to each body of water. Some impoundment’s deep water may not exceed 12ft., whereas some reservoir’s deep water might easily surpass 40ft. In either situation, the principle still applies. That which attracts and guides the crappie out of the relatively deep water channels and into the shallower water is structure and cover. And, the crappie will relate to structure and cover. Structure is underwater geography. Often and understandably, the term structure is mistakenly used interchangeably with the term cover. You cannot see structure because it’s under water. Fishfinders, depthfinders, sonar units, whatever you want to call them, is the only device that will give you a look at the structure. Structure is the channel itself, points, ledges, humps, holes, flats, even rock piles. Cover is what sits on the structure. Hardwood brushpiles, bamboo “crappie condos,” artificial fish habitats, tree lay-downs, stumps and cypress knees are all examples of cover. When cover is placed on unique structure, there you will attract, find and catch fish. There is cover that you see above the water level and cover the crappie see submerged below the surface. Most crappie anglers fish visible cover that looks good to them. But, focusing your attention on the submerged cover can ultimately be more productive. After grasping the concept of “how” crappie move, the next step in predicting their behavior is to consider “what” the factors are that actually cause the movement. The first three that come to my mind are: water level, water temperature and water clarity. And, all three are absolutely tied together, one affecting the other. This is where the dynamic of predicting behavior becomes more complex and intuition, experience and just good ole hard work is necessary. Water level is the first factor that influences movement. Low water levels concentrate the fish. High water levels scatter the fish. But what influences their movement is the rise and fall of the water level. During a change in water level the crappie will transitionally move from one spot to another. Sometimes shallower, sometimes deeper, sometimes at the same depth, but they will move. They will not stop making moves until the water level stops changing. Here’s one possible scenario that demonstrates how water level influences you and the fish. It’s Saturday morning and you arrive at the lake and find it is low and off its banks. So, immediately you conclude that the mid-depth staging beds you caught a limit of crappie on three weeks ago might be too shallow to fish but you start with them anyway. Good choice. You catch a few but if your graph isn’t lying to you, the fish just aren’t stacked up like you’d like to see them. The day’s trip is half over by now, so you spend the rest of your time working deeper brushpiles and the fishing slowed even more. You only end up with half your limit this trip. You tell yourself the fish just weren’t biting well today, but when you get home your neighbor has a limit of monster slabs. After scratching your head and interrogating him, you find out he caught them on some of the shallower brushpiles you and he put in about a year ago. Your final conclusion is he zigged when I zagged, them’s the breaks. Nope, what your neighbor knew and you didn’t is though the lake still looked low, six days earlier the lake had actually come up 8-inches and had stabilized in the last few days. The rise in water level put more water over your shallow brushpiles allowing the crappie to invade them at a depth they wished to suspend. Keep a close eye on the day to day history of lake level changes. It will influence where you find the fish. Water temperature is another factor that will influence not only movement but also location. In general, extreme water temperatures, the very cold (50 degrees and colder) and the very warm (80 degrees and warmer) cause crappie to move into deeper water. And, when the water temperature is between 50 and 80, they can be found in the mid-range and shallow depths. 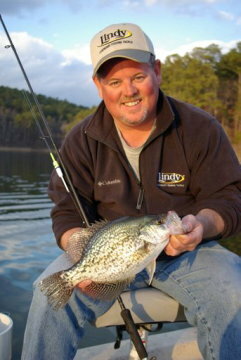 Just like a change in water level causes crappie to move, it is the change in water temperature that triggers movement. Falling temperatures in winter and rising temperatures in summer move the crappie deeper. Rising temperatures in spring and falling temps in autumn move the crappie shallower. These are the norms and by no means dictate where the crappie will be. It is important that you scout fish different depths in all seasons and water temperatures. Here’s an example that I personally experienced several years ago before I started guiding. It was late winter and I knew the crappie would start making their move to the shallows soon. All I had to do was, watch the water temperature and follow them. I was determined to be the first on the lake to catch crappie in shallow water that year. Week one, the surface temp is 49. Week two, the surface temp is still 49. As the weeks past, the temp slowly climbed. After about 6 or more weeks the surface temperature of the water in the main part of the lake had finally reached 58 or 59. Okay, now’s the time. The crappie should be moving into the shallows, making their beds and getting ready to spawn. So, here I go, weaving in and out of stumps, avoiding sandbars to check the shallows. When I get there the water temperature is 69 teetering on 70. What?! I almost missed the entire spawn and definitely didn’t catch the first crappie moving into the shallows. I learned a whole wealth of useful things from that experience. First, the change in water temperature in the main body of the lake, even a degree or two, had hastened the crappie to move. In this case, they probably weren’t in the very shallow spawning areas yet, but they were moving toward them when the water temp rose from 49 to 51. They moved and I didn’t. Second, there can be a huge difference in water temperature between the main body of water and the shallow water of the spawning flats and coves. During late winter, the sun is rising and setting in the southern hemisphere. This causes the northwest portions of the spawning flats and coves to receive more sunlight than other areas thus warming faster. When I was still fishing the deeper waters of the main channel, the water temp was in the low 50’s, the staging areas in mid-range depths just outside the spawning coves were in the mid-50’s and the spawning waters had already warmed into the low 60’s. And last, I should have been scouting the shallows and staging beds watching the water temperature from the very start and not just sitting in the middle of the lake waiting for a magical number. Checking the water temperature in all parts of the lake will paint a clearer picture of where the crappie might be and where they might be going. Don’t get in a rut. One study conducted on the Blood River portion of Kentucky Lake in 2004 showed the crappie stayed in 8 to 10 foot of water when the water temp entered 80 degrees and more. This is outside the norm, but not a problem if you’re constantly scouting. Water Clarity will also influence movement and location, but also depth of the crappie. In the main, the clearer the water is the deeper the crappie. And, visa-versa, the muddier the water is the shallower they might be. Why? Because the greater the visibility the more vulnerable the fish become. Of course, other factors influence this too, like the normal environment of the habitat, the amount and type of cover and overall depth of the water. If the normal environment of your lake is clear, for example, and a rain brings an influx of muddy, fresh water from feeder creeks, it will most likely drive the crappie out into deeper, clearer water. But if the normal environment is stained to muddy, the infusion of freshwater will make them move shallower looking for new food. Or, guess what, just the opposite might happen, so always do your scouting and check it anyway. Crappie will relate to cover no mater the clarity of the water. However, in stained water the crappie are less vulnerable to attack, require less cover for protection and will stray further from the cover than in clear water. In clear water the crappie must have an ample amount of cover to prevent their predation and ambush their prey. Most of the time water clarity influence angler’s choice of bait type and color. Such decisions are important, but don’t forget to factor in what the water clarity has done to move the fish and at what depth they decide to stop. Here’s an example that demonstrates how water clarity influences the crappie in all the above mentioned factors. At the time, I enjoyed fishing an oxbow lake off the Mississippi River. I would watch the river stage to determine if the water was rising or falling and if it was high enough to flood the banks of the oxbow lake. The water had been rising for several days and then stabilized high enough that I knew there would be 15 or more foot of water in the willows around the banks and flats of this oxbow. Saturday came and the boys and I headed to the lake. The conditions seemed to be perfect. Expectations were very high. And, so thought everyone else in the country because the parking lot was full and there was a line at the boat ramp. Once we finally got on the water, we headed for the willows and as usual trolled down the line dipping and dobbing our jigs around every tree we passed. We fished and fished with not even a hint of a bite. We exited the flooded banks and went to check the main channel that ran the length of the oxbow. No luck there, plus it was really too deep now anyway. We went back to the flooded willows to fish. That’s when I realized that though the water was high and the amount of cover seemed endless the lake had been stable long enough to become clear. Clear is not this oxbow’s normal water color. I was spooking the fish before I could catch them. Okay, with certainty they are in the cover of the trees due to the water clarity and all we have to do is make the right adjustments and catch them. To keep from spooking the fish, we slowed down the boat and restricted our movement in the boat to reduce noise. We found the crappie holding at nine foot deep in 15 foot of water. In order to entice a bite, you had to drop your jig down to the right depth touching the trunk of the tree on the shade side and hold it there very still, sometimes as long as a minute. We finished the day with a respectable mess of crappie. When other crappie fishermen questioned us how we faired, I showed them. I remember thinking we could have done better and they will give us a hard time for not catching more fish. Such was not the case. Most of them finished the day with a big, fat zero. When I told them how we did it and why (due to the water clarity), they admitted they hadn’t taken that into account and would do so the next time. Water clarity does influence the crappie to move and it affects how you must fish for them. Now that you are taking into consideration how crappie move and what it is that influences them to move. Let us consider the factors that crappie like and dislike. Bait is always the first to my mind. The battle over bait is as old as the time itself. Some angler’s prefer live bait, whereas others prefer artificial. Personally, I use both and have equal number of days where the crappie preferred one over the other. Most importantly, I let the crappie tell me what they like and don’t force my preference on them. Plus, each angler must take into consideration their particular fishery may be different than others. For example, it is common for crappie in northern waters to eat small shell fish, but not as common in southern lakes where shad are plentiful. Such would also influence the type of artificial bait as well. Matching the hatch is also important. If the crappie in your lake are feeding on large three to four-inch shad, then I certainly would not be fishing with a small two-inch jig. The presentation of your bait, whether live or artificial, will vary with each angler too. Some like to cast jigs for crappie where others prefer to use long poles for a vertical tight line method. Some anglers have even graduated into more sophisticated methods like slow trolling tandem jigs and fast trolling crank baits. No matter which presentation method you choose, the type of impoundment you fish and the crappie themselves will determine which presentation method will be the most productive. I would suggest a crappie angler become proficient in all these presentation methods so you can adjust to the situation of the day or season. The list of factors that influence crappie’s likes and dislikes are practically endless. However, one factor that we must consider is the species themselves. No, now is not where I begin to spout scientific names. But rather, there are specific likes and dislikes that differ between the two main species of crappie. Black crappie prefer clearer water, whereas white crappie are more tolerant of stained and muddy water. According to a study completed by Kentucky’s Game and Fish biologists, black crappie tend to move into the spawning shallows faster than white crappie. Thus, the conclusion we can draw from that is black crappie will attempt to spawn in cooler water and white crappie tend to spawn later or longer when the water is warmer. Also, according to the same study, the black crappie remained in brushy staging depths after the spawn when the white crappie moved out to deeper water off the main channel. All in all, there are enough differences in the species to cause an astute angler to take notice. We should not only take notice of the normal likes and dislikes of our favorite fish, but we should also consider that they can and will stray from the norms. Earlier in the article I wrote about the seasonal influences on crappie. Normally crappie will utilize shallow water in spring and fall and deeper water in winter and summer. However, according to the same study mentioned above and like I’ve already mentioned in this article, crappie were found in great numbers in water depths as shallow as eight-foot when the water temperature exceeded 80-degrees. This is not common but shouldn’t be overlooked. When the crappie are not in a normal pattern, look for them in the unlikely pattern. There just may be a factor influencing the fish that we haven’t considered yet but might discover. Keep for yourself an entire portfolio of spots to fish. Once you find that pattern then you can fish all the spots that match the pattern. Be willing to adjust the time when you fish. Normally, we anglers say the bite will be in the morning, when in reality the best bite might be in the evening or at night. Just keep in mind that crappie like any other living creature has likes and dislikes. If you give them what they like the way they like it, then you’ll catch more fish. Lastly, remember that super-computer I spoke of in the beginning. Well, super-computers are dumb and inadequate compared to you, the avid crappie angler who spends a lifetime in this passionate pursuit. The human mind by means of experience and education, intuition and reasoning, is the only thing capable of putting all these factors together, making sense out of how they fit together and using the result to succeed. I cannot give you the formula for success, but you can make one for yourself. First and foremost, experience is the best teacher. Reading to educate yourself is good too. Having a network of friends who also fish is a great source of information, if you can get them to tell you the truth. Just don’t sell yourself short. Every angler willing to spend enough time on the water will become successful sooner or later. You learn something new every time you go. As the years pass and the collection of experiences grow, you’ll find that it is easier and easier to predict crappie behavior and put a pattern together. And if all else fails, make sure you’re having fun and quote Rodney Dangerfield’s character in Caddy Shack, “Last time I saw a mouth like that, it had a hook in it,” provided it’s not your wife or girlfriend. Locate the winds direction and set you boat in position to drift along the break. (change in bottom depth) Make sure your boat drifts along the deeper side of the break. You will use your trolling motor to keep your drift in position along the deep side of the break. If you don't have a trolling motor your have to use you boat motor to get back in position. (this can spook the fish, thats why a trolling motor is recommended. The Depth finder will be your guide to stay along the deep side of the break, and to locate the fish. Set up a weighted crappie rig to just touch bottom with sinker position your baits about 18 to 24 inches off the bottom. As you drift, watch the rod tip, it will bounce up and down slightly as the weight drags along the bottom. If the tip of the rod remains still the sinker is not in contact with the bottom. When you catch the first fish drop one of your marker buoys to mark the spot. Continue to drift until another fish is caught or about 75 yards, then drop another buoy. This marks your drift location for a return drift or anchor position. Drift about 50 more yards past the second buoy then start up your boat motor and go around the buoys approximately 75yards away. Know move your boat back in position for another drift. Normally the school will be concentrated in one area. Keep working the spot until you get no more bites. If your lucky you can catch your limit and a short time. CRITICAL CONCEPTS - Keys to help you catch more crappie. Master the Light Bite. You dip your jig in the water just inches from that old stump. Your anticipation is very high. You give the jig a little wiggle. Suddenly, like a lightning bolt shooting through your arm, that speckled monster slams your jig. It would be nice if this happened all the time. But, we all know it doesn’t. More times than not, crappie feed less aggressively. So, mastering the little bite will increase your catch rate. Start with the pole. When fishing pole-in-hand vertical, called dipping or dobbing, the right pole is the foundation you build upon to master a light bite. The pole length and weight should be comfortable and controllable. The balance and action of the pole must allow you to fish all day without fatigue in your hand and lower arm. There are dozens of great crappie poles on the market. The one that serves me the best is the BnM Buck’s Best UltraLite. To me the 10-foot length is the right weight, easily controlled and perfectly balanced when mated with a Pflueger ultralight spinning reel. Find the one that works best for you. Now that you have built the foundation, develop a technique to feel the slightest of bites through the line. Feeling the bite through the pole or seeing it in the line is secondary to feeling the bite through the line. While holding my pole at or just forward of the reel, a technique I have learned to use pulls the line up with the middle finger allowing the line to touch the back of my index finger. The back of your index finger is very sensitive. With this technique, you can feel every move of a jig as light as 1/48th of an ounce. Not only can I feel the lightest taps, I can feel when crappie pick the jig up and take the weight off the line. Set the hook! Master your Electronics. Not too many years ago, my fishing partner would point out the bank line-up for a new brushpile. “You see those two crooked gum trees with that tall pine behind them,” he would say. Sure I did, maybe? The next time I returned it would take five minutes or more to locate the right spot. When I started using a GPS I increased my catch rate by 20%. Instead of taking minutes to locate the right spot, it now only takes seconds. If you fish 20 different spots per day and the use of a GPS gets you in the strike zone in 30 seconds as opposed to 5 minutes, you can add as much as 90 quality minutes of fishing time to your day. 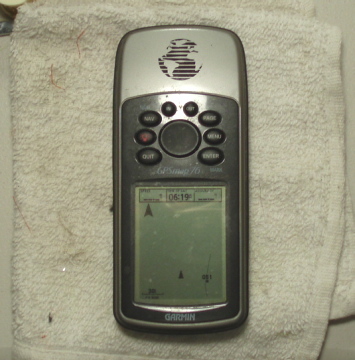 I use Garmin’s GPSMap76. The larger screen is easy to read. The wide area augmentation system (WAAS) feature puts you within 5-foot of your waypoint. It floats. 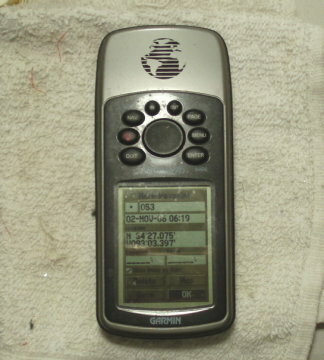 Its 8 megabytes of memory allows you to store 1,000 waypoints. And, the new CX and CSX models are color and feature an improved receiver for faster position updates. Your eye under the water is your sonar unit. The past few years have given us greater advancements with this technology. I presently use Humminbird units, but I will be the first to say other manufacturers make quality units too. No matter which unit you have, learning to use it fully aids you in catching more crappie. First, set your sensitivities correctly. Most units have two sensitivity settings – one for the unit overall and another for the fish ID. If your unit is set correctly, you should be able to get a sonar return on a small jig but not identify it as a fish. Drop a jig into the unit’s cone. Turn your sensitivity down until it disappears and then back up until it reappears as a fine line on your screen. As you move the jig up and down, turn the fish ID sensitivity down until it stops identifying it as a fish. Your unit is now set and you can have confidence that what you see is true. Second, set your depth offset. If your transducer is one-foot under the surface of the water, your depth offset should be +1. But don’t stop there. Check it for accuracy. On a calm water day, anchor or tie up to a spot that has a hard bottom. Drop a bank sinker to the bottom, mark the line at the water’s surface and measure the actual depth. Adjust your depth offset accordingly. Now learn the relationship between your depth reading and the grid lines. Have confidence you can precisely read the depth at which the fish are holding. Third, once your sensitivities and depth offset is perfect, learn to interpret the sonar return. Know the difference between cover and fish. Learn to read a fish’s sonar return when it’s in the cover. Newer color units make this simpler by displaying a different color for varying densities. Understand that when the boat is moving or the fish is swimming through the cone, a nice arch will form. Otherwise, when movement is minimal the sonar return is a flatter, longer line as opposed to an arch. Ultimately, your skill should grow from just finding fish to targeting specific groups of fish at a specific depth. Such abilities will put more crappie in your livewell. Master Depth Control and Boat Control. Crappie are finicky, don’t feed aggressively most days and elude you more often than not if control is not exercised. Depth and boat control are two critical concepts that when mastered will put more fish in your boat. Using a slip float and bobber stop rig is a way to ultimately control the depth at which you are fishing. Use your pole to measure the depth and set the stopper at the chosen depth. Fish with more than one pole and set them all at a different depth. Once you identify the depth at which the crappie are feeding, reset them all to that depth. When tightlining, develop a method to identify your depth precisely. I mark my line at 20-foot with a permanent marker. The position of that mark in relation to my pole tells me exactly how deep I was fishing. When you master your electronics you will identify the range of depth the fish are holding. Fish those depths. It is unproductive to fish five-foot above them and ten-foot below them, for example. Some crappie anglers drop their jig all the way to the bottom and fish every depth by reeling up until they catch a fish. This technique risks getting hung in the brush plus you spend more time outside the strike zone than in the zone. Identifying the depth the crappie are holding, fishing that depth in a controlled manner will result in more fish at the end of the day. Crappie don’t always hold on all sides and throughout a brushpile. Sometimes they can only be found on one side. Sometimes they are found more abundant on more than one side of the cover, but only the ones on the shallow side are actively feeding, for example. Locate the dining room. Go to them, don’t wait on them to come to you. And, if they don’t play, don’t stay. Move. Run and gun until you find the hungry ones. Whether you use an anchor or just use your trolling motor, when you can maneuver your boat in such a manner that permits you to fish where the actively feeding fish are, you will put more fish in your livewell. Master the Habitat and Support Network. The lake we fish is a nearly 60-year-old reservoir. What little natural cover remained after they clear-cut the lake before filling it with water is long gone. So, sinking cover for habitat is vitally important for the survival of the fish. Habitat is not the same thing as building a fish attractor. Good habitat will attract fish but it offers more. The habitat we build has large stalks and spots for mature crappie to live but there are also dense spots for the fry to live and eat. Such habitat will reduce mortality and increase recruitment. Planning for seasons in years to come will keep putting fish in your livewell and when mastered will increase the number and size of fish caught. And, it’s nearly impossible to do all this yourself. Having a good support network of friends will guarantee you success in your habitat program. Also, making friends on the water is better than going it alone. My partner and I, plus other friends on the water help each other identify a pattern and locate the crappie faster. When we guide clients we will often divide and conquer. The use of cell phone technology allows us to stay in communication with each other. As a guide, I often help other friends who do not guide. The result has been a beneficial and profitable friendship. If when they are on the water and they get into the crappie real good, they’ll call me and let me know how they are doing. Ultimately, it’s always better to have friends on the water and it will help you catch more crappie in the end. I know it’s human nature to be competitive, but crappie are so prolific even if we all ban together and help each other, the crappie will still prevail. These are the critical concepts that I believe when mastered will help you catch more crappie. If I can be of any further help or wish to inquire about booking a guided fishing trip in Central Arkansas to experience firsthand what I’ve written about, visit my website at www.familyfishingtrips.com, email me at darryl@familyfishingtrips.com or call Darryl Morris at 501-844-5418.